Although arguments still rage about whether the Arctic sea ice is disappearing, the disappearance is a fact of life for those who live near the Arctic Ocean. 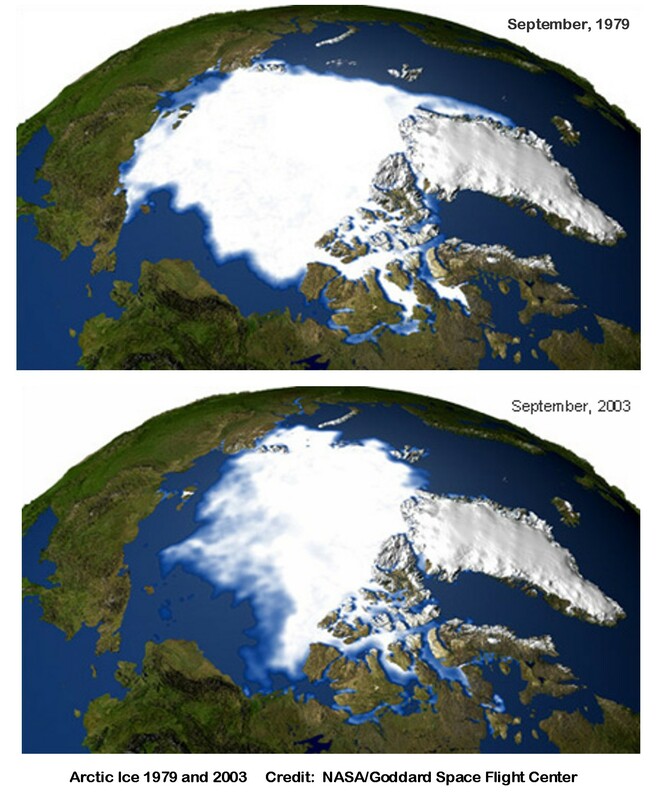 The photos clearly show that the Arctic Sea ice is disappearing. A recent TulsaWorld article described how the disappearance of the Arctic sea ice has affected the lives of the native Inuit people in Greenland. Ice which used to be 2 meters thick in the winter, now grows only a few centimeters thick, far too thin to allow dogsleds to go to the nearest town, 50 miles away across the bay. They can no longer venture onto the ice to hunt for seals or walrus, a mainstay of their diet, nor can they go out on the ice to fish. The Polar bears they sometimes hunt have no fat, as the bears cannot swim to the ice packs to hunt, and they sometimes prowl the villages looking for food. Drilling for oil has picked up in the area as the ices disappears, but so far little oil has been found. Exploration continues, and if oil is eventually found, it carries the possibility of economic development. But it also carries the possibility that an oil spill, almost impossible to clean up in the icy environment, would destroy much of the ocean life the natives now depend on for food. The sad thing is that they are being forced to change a way of life that sustained them for centuries. While some may adapt, their way of life and culture will be destroyed, and many will likely end up among the poor and unemployed. ” Charles Sollie Hugo, a Native elder and oral historian with the North Slope Borough in Barrow, grew up hunting with his family. However, as the times when rivers freeze has shifted to later in the fall and their thawing has begun earlier in the spring, the window of time when it’s safe to traverse the land has narrowed, making caribou hunting less of a part of his life, he said. This entry was posted on Monday, August 22nd, 2011 at 9:55 am	and is filed under Bits and Pieces, Climate Change, Education. You can follow any responses to this entry through the RSS 2.0 feed. You can leave a response, or trackback from your own site. It is a truth that the environmental decline hurts at places where human society is most vulnerable. The cause of such vulnerability may be poverty, backwardness or ignorance. Whatever be the cause, this is one truth which is very inconvenient. We have already seen the first of environmental refugees in Alaska and in the Indian Subcontinent the coastal communities are threatened as well. We are looking at the face of a threat of such global proportions that sometimes the country specific measures to tackle it seems inadequate. We are connected in adversities if not in prosperity. I hope your brief article here is read by the largest of audience. Thank you. I certainly apprecite your articles on http://chimalaya.org/ and http://pabitraspeaks.com/ that describe the effect of global warming on the lives of people in the Himalayas and Bengali. I recently read of serious flooding that occurred in Bengali, which was possibly made worse by global warming. I hope you will write an article about that. People who live from the land are aware of the changes that people in cities do not see.